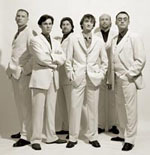 Recognized by authoritative musical critics as "one of the premiere vocal groups in the world", the Ukrainian sextet ManSound is constantly compared with the American group "Take 6 ".But the journalists emphasize that "ManSound" differs from its colleagues not only by its Slavic roots, but also by an extraordinary emotional presentation of original compositions. Created by the composer and arranger Vladimir Mikhnovetsky, this remarkable sextet started its creative biography in 1994, and the first concert tour in United States in 1996 brought to the group a wide popularity and a first international success. Their harmonious sound, emotional interpretation, rich vocal and amazing skills brought them the recognition of audiences and music critics all over the world. The participation of the group in International contests brought them important awards - first prize at the Moscow competition "Jazz Voices ", first prize at the contest " Ward Swingle Award" at the Lionel Hampton Jazz Festival in America, first prize at the a cappella contest " Vokal Total" in Austria and the nomination for "Best vocal group 2001" at Branson's All American Entertainment Awards in Missouri. In the last ten years, ManSound has toured Europe and USA, expanding the circle of their admirers and demonstrating the high level of the Ukrainian vocal culture. Anatoly Vapirov, saxophonist and composer, has a place of honor on the world jazz scene as a famous jazz musician and the artistic director of the biggest jazz festival in Bulgaria. Graduate of the Leningrad Conservatory in the late 60s, now he is one of the leading musicians and composers of modern jazz, having a rich concert activity and being present at the largest jazz festivals of Europe and America. He has composed chamber pieces and music for ballets and drama plays, for films and TV programs. Many of his compositions have been released on LPs and CDs. Vapirov is the author of more than 50 CDs released in Russia, Bulgaria, Austria, England, Germany, Denmark, Italy and Switzerland. Yurii Kuznetsov one of the best Ukrainian jazz musicians, composer, pianist and master of spontaneous improvisation, the director of "Club of high music", director of festivalului Jazz carnaval din Odessa After graduating the Stolearsky school and Conservatory in Odessa, collaborated with jazz star musicians and composers like Vladimir Cekasin, Vitas Labutis, Vladimir Tarasov, Igor Bril, Rlexei Kozlov, Igor Butman, Drorom Failer (Sweden), V. Miller (Great Britain), Diter Glavishnig (Germany), And Shviber (Austria), Daniel Breal (France), Tim Srong (USA) Since 1995 his name is plased in the "Jazz encyclopedia " edited in USA. He performed in international festivals in Greece, Switzerland, Germany, Spain, France, Bulgaria, Russia, Great Britain , composed music for the films: "A smell of autumn", "Taxi - blues", "Impression", "Summertime", "Mezerlro". 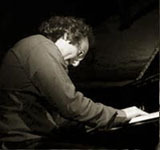 Rudi Neuwirth is the Prizewinner of the "Berlin Jazz Award 2002". For more then ten years he leads the jazz sessions in the worldwide famous Berlin Jazz club "Quasimodo" performing solo and with orchestra. He is the author of soundtracks for cinema & TV movies, for theater performances & comedy shows. He is also famous for his solo program called "Vocal beat" where he, using his vocal, obtains the performance to imitate the sound of a whole orchestra. The voice of Rudi is an instrument and he is creating on stage real pieces of music. You can hear and see him imitating the sound of a jazz orchestra a la Miles Davis, of a Bavarian brass band, of a Salsa orchestra, of a traditional Rumba Orchestra. Using his voice, he is able to create the image of an African market, or to represent the Berlin Jazz festival in 1969, or musicians playing in the Reggae Park, or he takes the audience to a travel through India and Cuba. Sergio Gruz, pianist and composer, was born in Argentina where he studied jazz and classic piano at the University of Buenos-Aires. 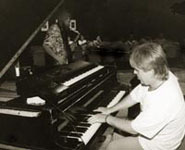 In 1993 - 1995 he was teaching composition and jazz piano at Salle Pleyel and Musiques Tangentes in Paris. Sergio took part in the festivals in Santo-Domingo, Monreal, Leverkusener in Germany, "Belga jazz" in Belgium, "Tango Festival" in Montevideo and played in the most famous jazz clubs of Paris - Le Petit journal de Montparnasse, Sunset, Chabada, Les Trinitaires, Le Baiser Salle. His discography consists of 7 albums, recorded with various groups. Born in Venezuela, Juan Sebastien Jimenez was growing up in an atmosphere of music, accompanying from his earliest childhood on bongo and maracas his father - Guillermo Jimenez Leal, well known musician, singer and composer. Juan Sebastien spent his youth in Paris, studying percussion, guitar, Cuban guitar, bass guitar with six cords and cello. In the 90s he enriched his musical experience in latino rhythms, playing with such musicians as Alfredo Rodriguez, Miguel Diaz, Orlando Poleo, Eddy Palmieri. he is playing in the jazz group of Sergio Cruz, with Nelson Veras and with a group of Brazilian music. 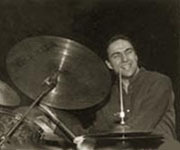 Bachelor in economy and sociology, Pascal Rey studied music at the School of Percusssion Dante Agostini, having as teachers Daniel Dumoulin and Francis Lassus. In 1985 he started his career as a studio and concert musician, playing jazz, blues, funk, hard rock, afro and improvised music. He toured the Europe with World Jazz Trio having as partners Daniel Mille and Jean-Christophe Maillard, in America he gave concerts with Jazz Sud Trio, playing with Sylvain Luc and Jean-Marc Jaffet. 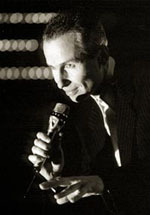 From 1996 he is conducting the percusssion orchestra Elentes Machines. He recorded 7 albums in collaboration with Luis Sclavis, the Arab singer Akim el Sikam Eya, French singer Jehan, with african musicians Gilles Rennes, Philippe Selam, and with the group of electro-acoustic music La Goutte. The music of Kampec Dolores is an unique synthesis of original melodies, lyrics, and subtly broken rhythms. Their music combines the Hungarian folklore with modern jazz and contemporary improvisational music. Created by Csaba Hajnoczy and Gabi Kenderesi in 1984, the group has won the popularity as the first group of alternative jazz-rock-folk in 1986, after their concert tour in 12 countries of Western Europe. Their American debut took place at the prestigious "Victoriaville" Festival in Canada in 1999. The group toured in almost all the countries of Europe: from Spain to Russia and from Sweden and Norway to Italy and Yugoslavia. Since 1988 the albums of the group are produced in Amsterdam, Budapest and London. The CD "Levitation", released by ReR Megacorp in London, was awarded in Hungary, in 1991, the prize "The Best alternative CD". This duo is playing the actually powerful, sensual, the intensely emotional music, which is inherent to flamenco, that swings between ecstasy and desperate yearning. Spanish, born in Tangiers of Andalusian parents, Eduardo is the seventh son in a family of eleven, nearly all of whom are talented artists or musicians. Two of them, his brothers Jose a painter and Salvador (a drummer), along with Eduardo, are internationally acclaimed and respected artists. Niebla's first musical encounter was with accordion at the age of five, later with guitar. At the age of eleven Eduardo formed his first folk/pop band Los Helios, later the Guevara group and the group Metafora. His first professional band Atila, founded in 1973, produced three hugely successful albums: "The Beginning of the End "(New Promotions), "Intentions" (BASF) and "Reviure" (EMI Odeon), composed and arranged by Niebla. In addition to winning various prizes, they were voted one of the best groups of 1974-75 by both the Spanish public and music critics. 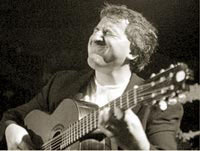 His solo career begins in 1981, when Eduardo was voted among the best guitarists in the Hispanic peninsula. His stunning, passionate mix of Latin sounds, Spanish flamenco and jazz impresses any audience and his unique undisputed virtuosity is marked by most requiring musical critics - "Niebla is the King of Latin-guitar - a world class virtuoso", "Stunning flamenco-jazz guitar pyrotechnics" Eduardo Niebla recorded and produced in Spain and England 21 CDs. 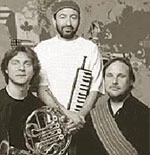 Since 1991, this group of three excellent musicians is opening new boundaries in modern improvised music. The aesthetic concept of the world-glorified Moscow Art Trio is based on the imaginative music, combining intelligence, humor and technical brilliance. These three exceptional musicians developed their own modern original style, fusing new musical forms, free spontaneous improvisation and ancient models of folk music of different origins. Since 1993 professor of piano and composition at the Music Academy in Oslo, Mikhail Alperin can be named the founder of the ethno-jazz style. His contribution to contemporary music is not only the unbiased integration of the most various musical traditions and the crossing of stylistic boundaries - he also fuses, freely and easily, music of the past with modern elements. Mikhail Alperin started his rich creative way in Moldova in 1980, when he, with Simon Shirman, created the first jazz group Quarta. The music of this group became the first successful professional experience of jazz and folk linking. 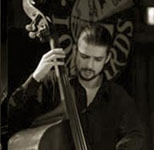 Besides numerous albums recorded with Moscow Art Trio, Michail Alperin recorded solo CDs and CDs with music of Paul Hindemith and other composers of Classical Modernism, produced by the ECM Company. "The incredible" Arkady Shilkloper, one of the world best French horn players, played in the famous orchestra of the Bolshoi Theatre, the "Bolshoi Brass Quintet" and was a soloist at the Moscow Philharmonic. He is in demand as a soloist the world over and, among others, was invited to play with a number of renowned ensembles and musicians, such as the Vienna Art Orchestra, Pierre Fauvre's Singing Dreams, Luis Sclavis. One of his four solo CDs has been named by the association of jazz journalists of Russia "Album of the year" in 1998. Sergey Starostin graduate of the Moscow Conservatory and spent many time in folk expeditions in the remotest parts of Russia, collecting ancient melodies and songs. He is the author of programs of folk music for Russian Radio and TV. 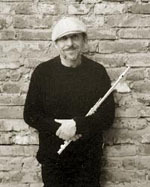 As singer and instrumentalist, Starostin is the member of a great number of jazz folk projects, such as the group of folk dance and music Bilina, the folk quartet Slavichi, Bratchina, the Folk Opera, a cappella group Kazachiy Club, Inna Zhelanaya group, the Eurasian Art Ensemble and a new Russian Jazz-Folk trio. The UniVox jazz vocal group was formed in 1999 by the students and teachers of the "G. Muzicescu" Academy of Music in Chisinau. The repertoire of the UniVox group includes the finest music in different styles and genres, but the group visibly prefers jazz music playing a cappella. Promoting local contemporary music, their repertoire also includes music of Moldovan authors - Igor Iachimciuc, Marian Starcea, Dumitru Belinschi. The singers of UniVox participated at the master classes of such well known jazz singers and musicians as Anca Pargel, Mihail Alperin, Ivan Paduard. The group took part in national and international contests and festivals: "Martsisor" Chisinau (2000), "Jazz Weekend" Chisinau (1999-2000), "Intact" Cluj-Napoca (Romania), "FIMU" Belfort (France) - (2000-2001), "New Impro Music" festival - 2002. In april 2004, the group won the III prize at the international festival "DODJ" 2004 in Donetsk (Ukraine).